Cindy Needham: Featuring Kathy Harris! I was thrilled to be able to teach for the Tucson Quilt Guild last fall. One of the workshops I taught was my "Open Thread Bar"...this is an all day class on thread education and thread play and I get to the be the "Bartender" for the day. I always have an assistant who I dub as my "wench"...can you tell we have fun??? "I was your "surly wench" at the thread play class in Tucson. Our shop does a Secret Santa each year and the gal I chose is a lover of all things "princess". It occurred to me one day that I would take what I learned from your class and make her a pillow. Her name is Karen, or "KK" as we call her. 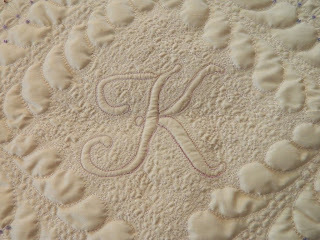 I layered champagne Dupioni silk over wool batt and a satin type back. 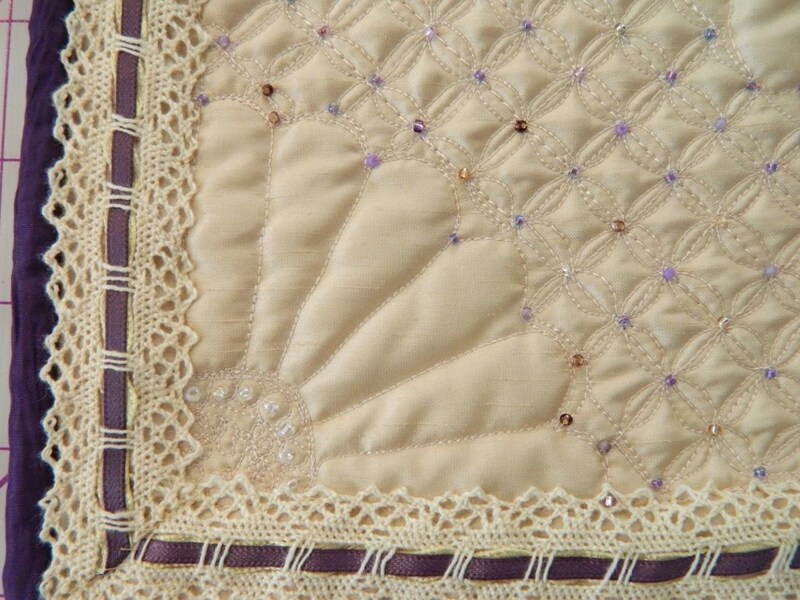 I used beads to embellish the cathedral window quilting in the outer area, and a lace trim finished the edge. I used a dark purple satin fabric for the backing and binding in an envelope style pillow cover. 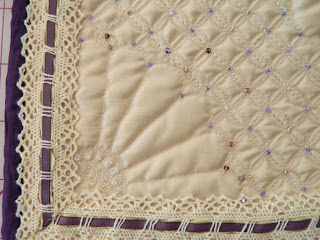 This was my first attempt at playing with the Dupioni silk after taking your class in Tucson. We tease KK about being a sparkly princess...this suited her to a tee!" Cindy, your guild presentation in Tucson was wonderful! Thank you for coming. I really enjoy seeing the students' work you feature in some posts. It lets me know there's hope with practice. I've joined SewCalGal's Challenge and I'm looking forward to your lessons in June. 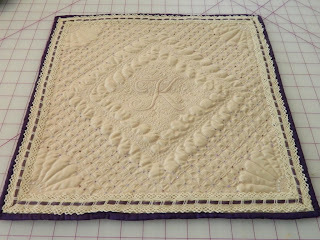 Please note though, that the link to your blog on SewCalGal's page, http://sewcalgal.blogspot.com/p/free-motion-quilt-challenge.html actually leads to Diane Gaudynski's site. I would have left a comment there but there are 187 plus comments, so I'm not sure she would see it. I hope you have an easier way to contact her. 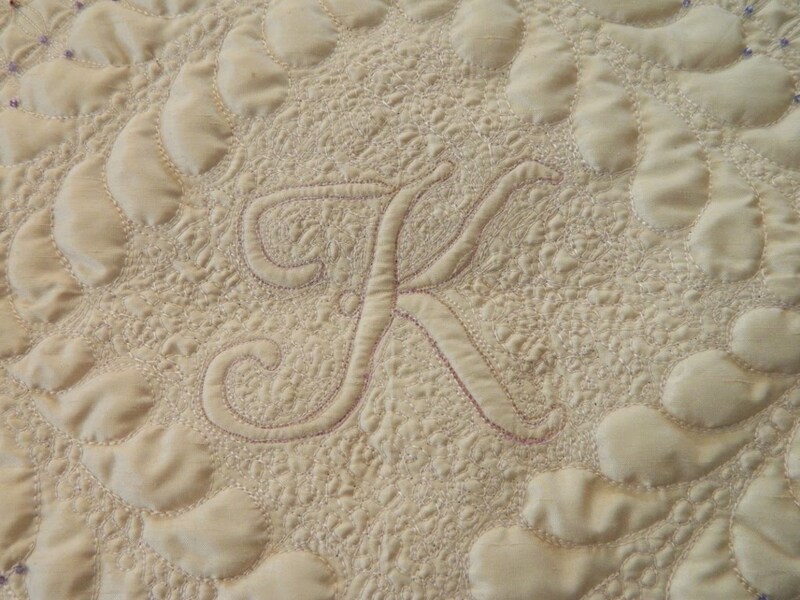 Kathy's piece is amazing. 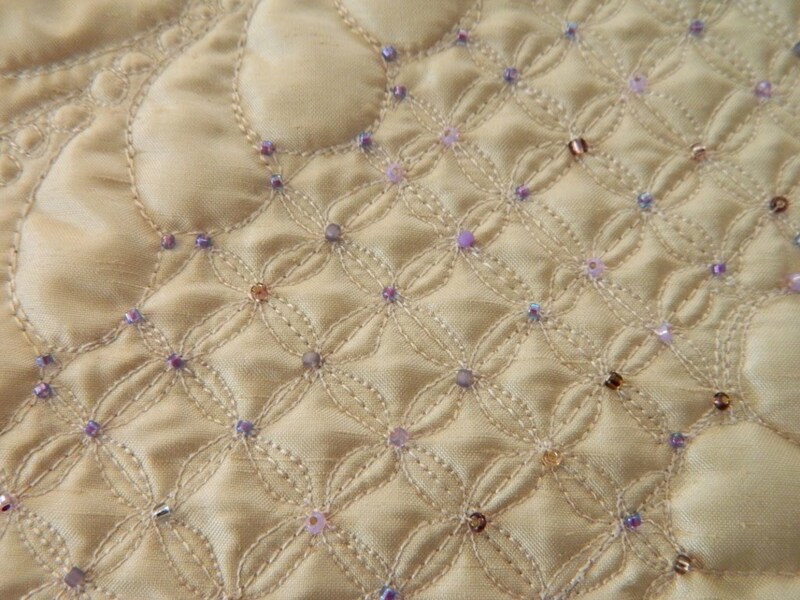 What wonderful stitching.